Kris Lees’ three-year-old spring team gets deeper by the week. Gem Song joins the likes of Miss Fabulass, Graff (third in the Golden Rose), Smart Melody as youngsters with spring Group One targets having won the opener at Rosehill Gardens. 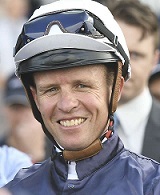 “He was a bit tardy away which meant he was back on the fence and Jason (Collett) had to navigate a passage. When the run appeared he let down well,” said Lees. The son if Your Song will also be nominated for the Victorian Derby. Meanwhile, the Spring Champion Stakes is likely to be the next stop for Frankely Awesome after winning her second career start at Scone on Friday. “I am going to have a good look at the Gloaming (today) but with small numbers, I’d think she’d run a race in it. She was very good yesterday,” said Lees. Coolmore's Everest runner US Navy Flag will arrive in Australia on Sunday. 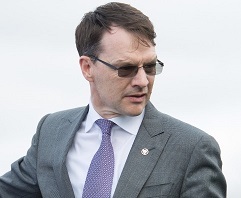 The Aidan O’Brien-trained sprinter will be stabled at Canterbury Park’s horse and quarantine centre as he prepares for the world’s richest race on turf, the $13 million TAB Everest. The three-time Group One winner is the highest rated international sprinter to be lured to Australian shores. He'll be accompanied by stablemate Somerset Maugham who will also been seen over the Sydney spring carnival. At this stage it looks as if the St Leger Stakes (2600m) is the race Somerset Maugham will be targeted at, but the Craven Plate is also an option. On the topic of internationals, Jungle Cat firmed from $51 into $17 for The TAB Everest on the back of his win in the G1 Sir Rupert Clarke Stakes at Caulfield but trainer Charlie Appleby has already all but ruled it out. Gloaming winner Thinkin' Big reminds Gai Waterhouse of Nothin' Leica Dane. Nothin' Leica Dane of course dominated the three-year-old staying ranks in 1995, taking out the Dulficy, Spring Champion, Norman Robinson and Victorian Derby. He then ran second to Doriemus in the Melbourne Cup - a race Waterhouse hasn't ruled out with Thinkin' Big. "It just shows you what a good horse he is," Waterhouse said after the son of High Chaparral romped home at Rosehill, "We always thought he'd be an outstanding chance in the Derby. The Spring Champion Stakes is his main mission in Sydney." "He is nominated for the Melbourne Cup. He reminds me so much of Nothing Leica Dane and his owner reminded me that on his damn side is Nothing Leica Cat (a grand daughter of Nothin' Leica Dane)." There is plenty of improvement to come from Thinkin' Big too, given he was first up for eight weeks. That was by design. "We didn't want him to do it all in the first preparation so we gave him two weeks to shoot the breeze. He has such a big motor and such a wonderful turn of foot," said Waterhouse. On the Spring Champion Stakes, Chris Waller said Dealmaker, who missed the Gloaming with a minor setback, will trial next Friday but would need to impress for him to line up in the race eight days later. Would Youngstar have won the Shannon Stakes if she was allowed to build momentum into the race? Perhaps. You'll only get two more chances to back the four-year-old this spring, and one of those she'll come up against Winx. Chris Waller said Youngstar will next run in the Turnbull against her star stablemate before tackling the Caulfield Cup fourth up. “I thought she was brilliant (today). It was the run of a winner. She is obviously looking for further," said Waller. Kerrin McEvoy echoed that sentiment. Youngstar simply wants further. “It was a good run. She got up and rolling and had to duck and weave in the straight. She is a mile and a half filly. It was a good run against those horses over that trip," said the jockey. Miss Admiration is set to back up in next Saturday's G1 Metropolitan after winning the JRA Trophy at Rosehill Gardens. “It was a great ride, perfect 10 out of 10 for what she needed to do. She was jumping up from 1600m to 2400m so she’s come a long way and done a good job," said Mick Price's foreman Pat Kearney. That could also be the case for The Lord Mayer after the Chris Waller-trained four-year-old stuck his neck out in the last. That made it an incredible nine favourites in a row to win the last race in metro Sydney Saturday races! Waller will be well represented in the Metrop with a team including Libran, Brimham Rocks, Patrick Erin and possibly High Bridge. Others in the mix are Jake’s Hill, Abdon and Opposition. Meanwhile, Richard Freedman confirmed Auvray, off a last start second in the Newcastle Cup giving Carzoff 5.5kg, will take his place in the field and will likely be top weight. Big Duke, runner up in last year's Metrop, won't be far behind him in the weights with Brenton Avdulla set to ride. Harrison has been pencilled in as Liam Howley's representative, with Lloyd Williams no stranger to winning the race. Foundry won it last year and Seville in 2013.